A galaxy is a gravitationally boond seestem o starns, stellar remnants, interstellar gas, dust, an dark matter. 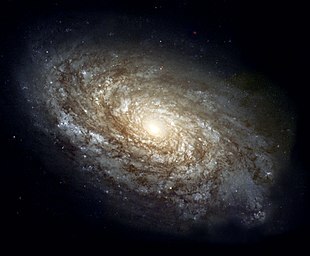 The wird galaxy is derived frae the Greek galaxias (γαλαξίας), leeterally "milky", a reference tae the Milky Way. Galaxies range in size frae dwarfs wi juist a few billion (109) starns tae giants wi ane hunder trillion (1014) starns, each orbitin its galaxy's centre o mass. Galaxies are categorised accordin tae thair veesual morphology as elliptical, spiral an irraiglar. Mony galaxies are thocht tae hae black holes at thair active centres. The Milky Way's central black hole, kent as Sagittarius A*, haes a mass fower million times greater nor the Sun. As o Mairch 2016, GN-z11 is the auldest an maist distant observed galaxy wi a comovin distance o 32 billion licht-years frae Yird, an observed as it exeestit juist 400 million years efter the Big Bang, accordin tae scientists. ↑ Hupp, E.; Roy, S.; Watzke, M. (August 12, 2006). "NASA Finds Direct Proof of Dark Matter". NASA. Retrieved April 17, 2007. ↑ Uson, J. M.; Boughn, S. P.; Kuhn, J. R. (1990). "The central galaxy in Abell 2029 – An old supergiant". Science. 250 (4980): 539–540. Bibcode:1990Sci...250..539U. doi:10.1126/science.250.4980.539. PMID 17751483. Graham, A. W.; Guzman, R. (2003). "HST Photometry of Dwarf Elliptical Galaxies in Coma, and an Explanation for the Alleged Structural Dichotomy between Dwarf and Bright Elliptical Galaxies". The Astronomical Journal. 125 (6): 2936–2950. arXiv:astro-ph/0303391  . Bibcode:2003AJ....125.2936G. doi:10.1086/374992. ↑ Jarrett, T. H. "Near-Infrared Galaxy Morphology Atlas". California Institute of Technology. Retrieved January 9, 2007. ↑ Finley, D.; Aguilar, D. (November 2, 2005). "Astronomers Get Closest Look Yet At Milky Way's Mysterious Core". National Radio Astronomy Observatory. Retrieved August 10, 2006. ↑ Gott III, J. R.; et al. (2005). "A Map of the Universe". The Astrophysical Journal. 624 (2): 463–484. arXiv:astro-ph/0310571  . Bibcode:2005ApJ...624..463G. doi:10.1086/428890. ↑ Fountain, Henry (17 October 2016). "Two Trillion Galaxies, at the Very Least". The New York Times. Retrieved 17 October 2016. ↑ Mackie, Glen (1 February 2002). "To see the Universe in a Grain of Taranaki Saund". Centre for Astrophysics and Supercomputing. Retrieved 28 January 2017. ↑ "Galaxy Clusters and Large-Scale Structure". University of Cambridge. Retrieved January 15, 2007.